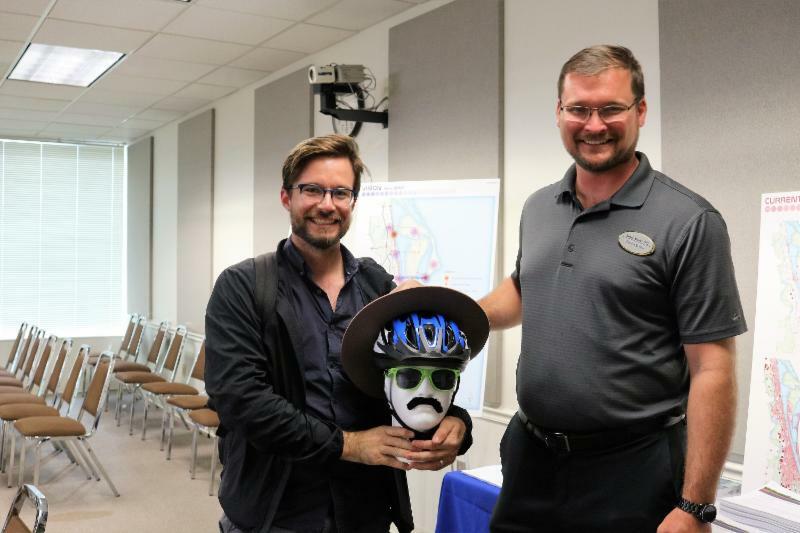 On J une 11, 2018, the SCTPO held its open house (Your Voice, Your Brevard: Transportation Planning for the Future) on the proposed 2019-2023 Transportation Improvement Program (TIP). The TIP lists each transportation project to be implemented over the next five years and it is a realistic forecast of projects that have committed state or federal funds so it serves as the SCTPO’s short range plan. Attendees shared their thoughts on trending projects and visited hands-on learning stations for their areas of interest. Trending Now : During vacation season, Florida’s roads can be some of the busiest in the country. Slow down and stay cool by obeying speed limits, reducing your speed in changing weather conditions, and knowing the speed limit on the roadway. Stay alert and be prepared. Transportation planning and design processes are always improving and evolving. Part of that evolution is continuing to provide and improve pedestrian systems. When designing and planning pedestrian facilities such as crosswalks and sidewalks, it is important to consider users of all capabilities. 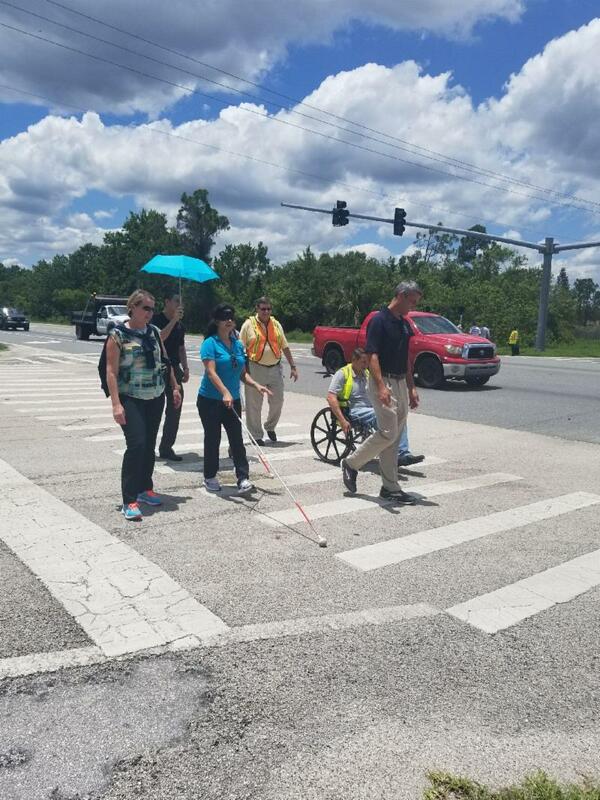 On June 7 - 8, 2018, planners and engineers from the Central Florida region attended a training offered by the Federal Highway Administration and Florida Department of Transportation, “Designing Pedestrian Facilities for Accessibility,” to discuss laws, regulations, and standards for design pedestrian features for persons with disabilities and to identify best practices. The two-day workshop consisted of lectures, hands-on activities, and a field visit, where participants had the opportunity to experience travelling along pedestrian facilities with various disabilities. 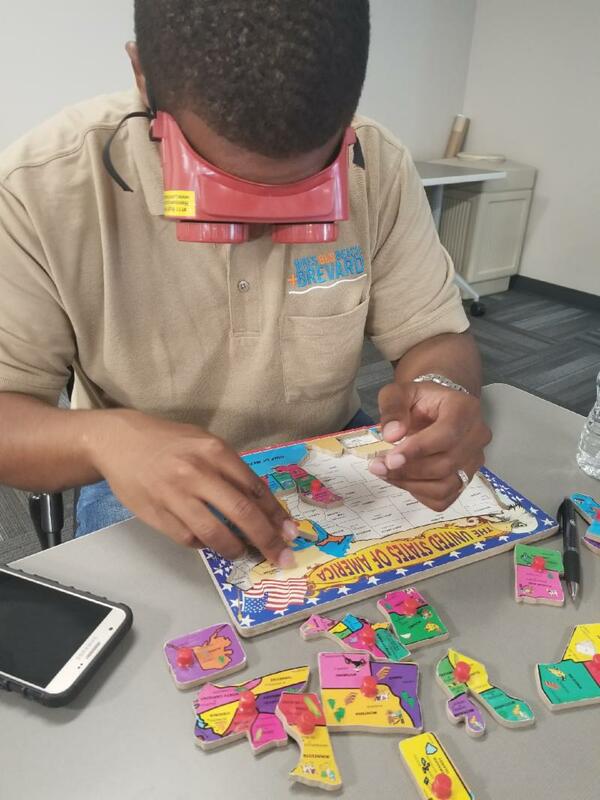 These activities helped educate the participants on the importance of planning for accessibility and maintenance of facilities. Day 1: Attendee s experience pedestrian facilities from various disability perspectives to understand the necessity to design for ADA compliance. 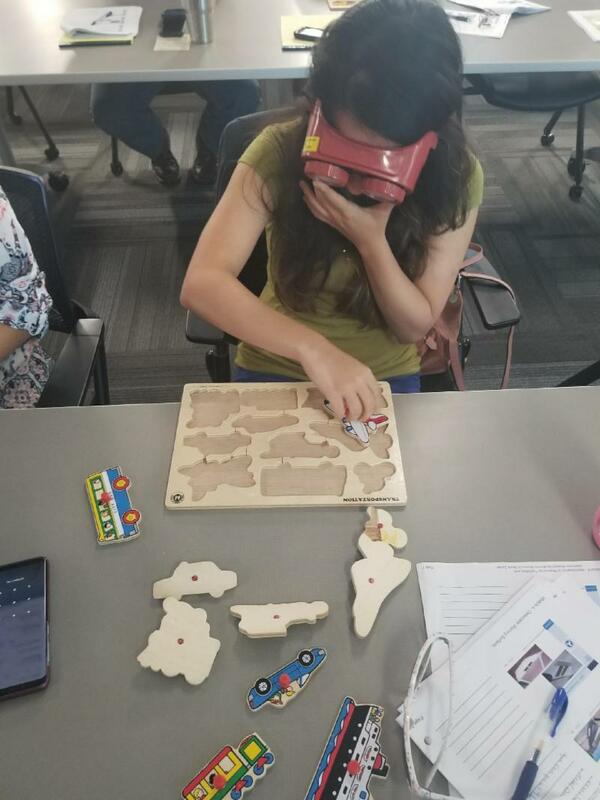 Day 2: Attendees use visually impaired goggles to do puzzle exercises to understand how color contrast in the pedestrian environment is an important factor when planning facilities. 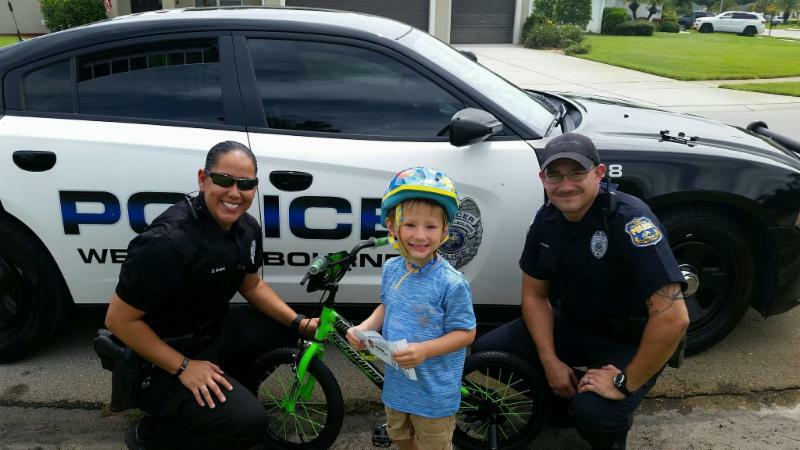 Community Spotlight : West Melbourne Police Department has once again launched its 'Operation Commendable Kids' program where officers use positive incentives to commend school-aged children on correct safety behaviors. 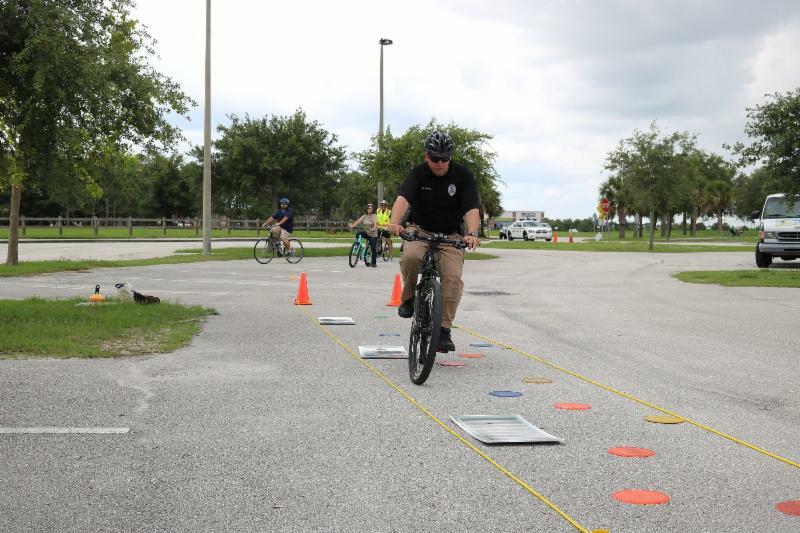 On June 6, 2018, the SCTPO hosted a Community Bike/Pedestrian Safety Education workshop where participants learned how to fit bicycle helmets correctly, bicycle/pedestrian laws and safety tips, defensive walking and bicycling skills, and how to conduct a bicycle rodeo. 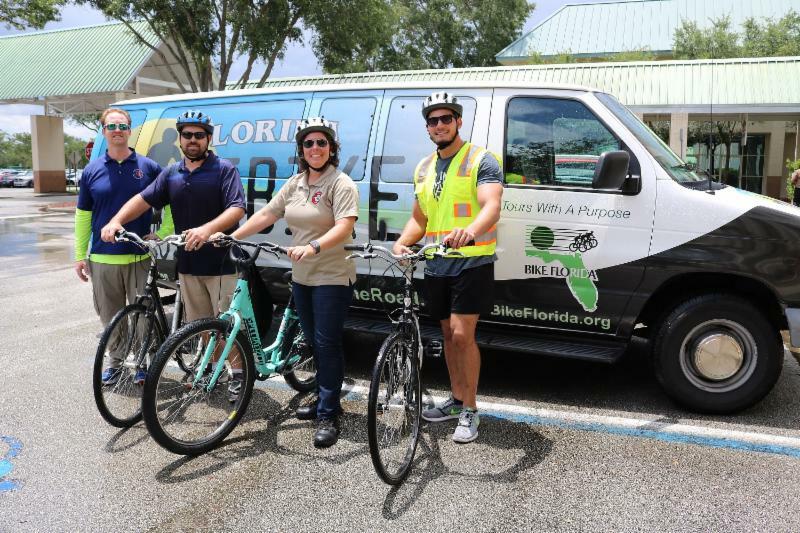 Attendees included representatives from City of Rockledge - City Hall , City of Titusville, Florida - Gateway to Nature and Space , reThink Your Commute , Titusville Fire and Emergency Services , Brevard Public Schools , Columbia Elementary School and West Melbourne Police Department . 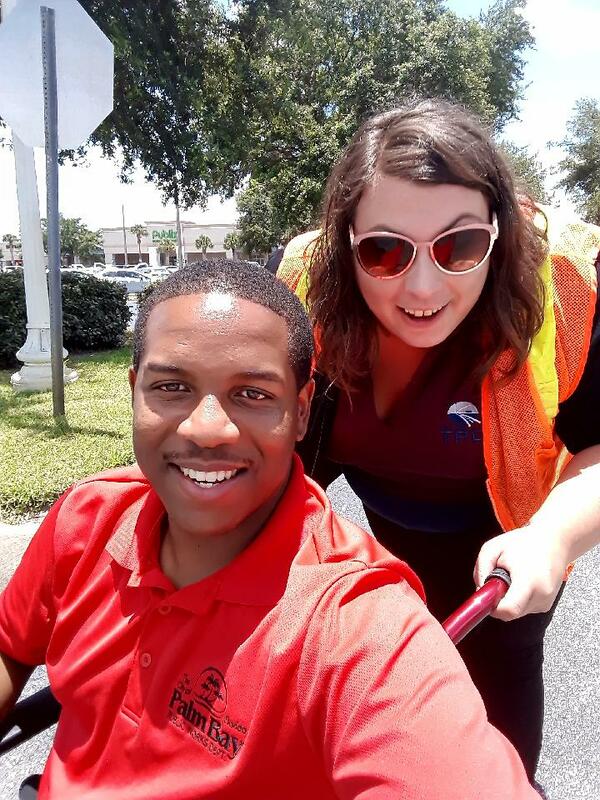 Space Coast Area Transit recently rolled out a QUANTUM pilot program with Q’Straint, a company focused on developing innovative solutions to advance the safety and effectiveness of wheelchair passenger travel. QUANTUM is a fully-automatic, rear-facing wheelchair securement station that allows passengers to fully secure themselves at a touch of a button, into a secure position with minimal driver assistance - all in under 25 seconds. Q’Straint retrofitted two Space Coast Area Transit buses with the QUANTUM at no cost to the transit agency as part of the pilot program. The buses are located at both north and south terminals. Community members are encouraged to experience the new QUANTUM wheelchair securement system for themselves. 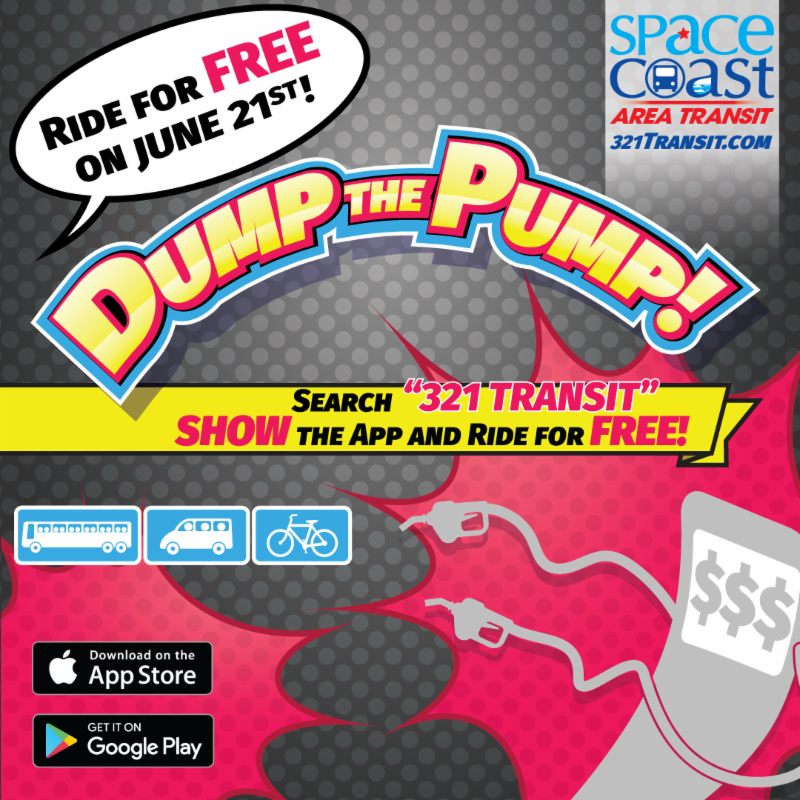 To schedule a QUANTUM ride with Space Coast Area Transit, contact Carmen at 321-635-7815 ext. 201. 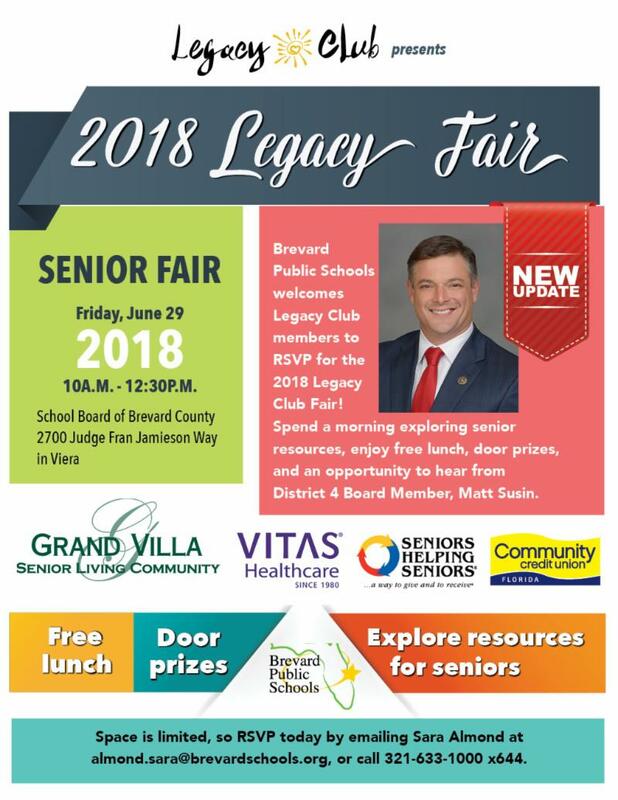 SCTPO staff is looking forward to attending Brevard Public Schools ' Legacy Club Fair on June 29, 2018. We will be there educating our senior citizens and distributing resources about bike/pedestrian safety and transitional mobility options. for the 2018 Legacy Club Fair! Spend a morning exploring resources for seniors, enjoy free lunch and an opportunity to hear from BPS Superintendent, Dr. Desmond Blackburn. 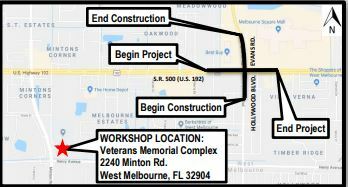 The Florida Department of Transportation (FDOT) is holding a public workshop to describe and illustrate planned improvements on the intersection of U.S. 192 at Hollywood Boulevard/Evans Road in Melbourne, Florida. T﻿he workshop will be held Tuesday, June 19, from 5:30 to 7:30 p.m. at the Veterans Memorial Complex at 2285 Minton Road in West Melbourne, Florida. The meeting begins with an open house, where participants may review project documents and discuss the project with staff. Written comments may be submitted at this meeting, or by mail, to Sameer Ambare, P.E., FDOT District Five, 719 S. Woodland Blvd, DeLand, FL 32720 or via email at Sameer.Ambare@dot.state.fl.us no later than June 29, 2018. All comments received will become part of the project’s public record. More information . 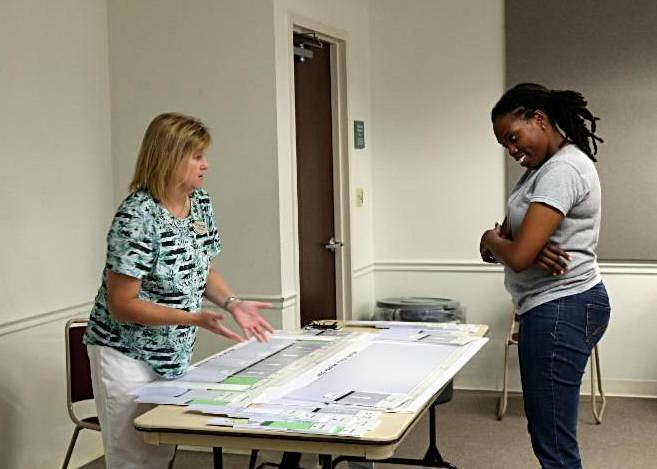 FDOT to Hold Public Workshop on Concept Development, Corridor Study of Fiske Blvd. 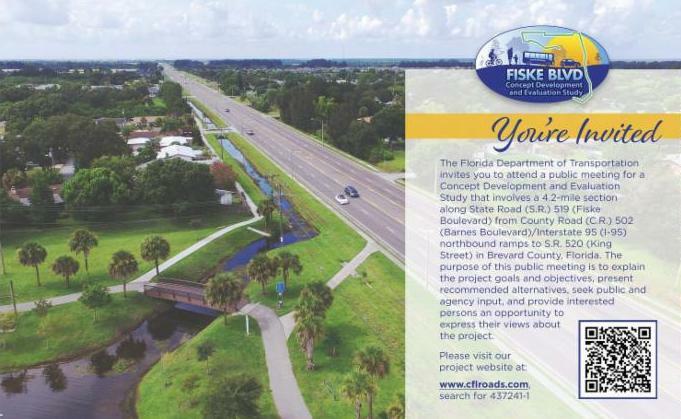 On Thursday, June 28, the Florida Department of Transportation (FDOT) will conduct a public meeting on a Concept Development and Evaluation Study involving a 4.2-mile section of SR-519 (Fiske Boulevard). 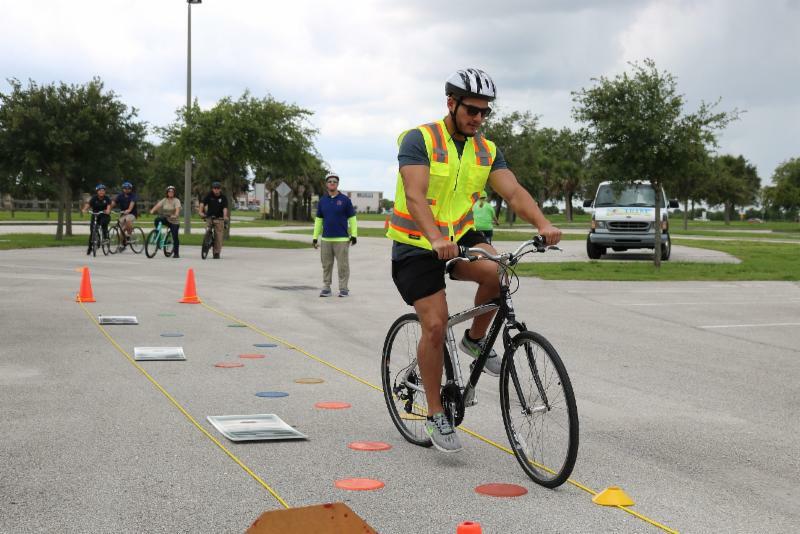 The meeting, which is scheduled from 6 - 7:30 pm at Rockledge City Hall, will be an open-house format, and FDOT representatives will be available to discuss the study and to answer any questions. Participants may provide public comment; written comments may also be submitted during the meeting, or by mail (no later than July 16), to Project Planner Dimitre Guenov, Vanasse Hangen Brustlin, Inc., 225 East Robinson Street, Suite 300, Orlando, FL, 32801. Read more about the Fiske Blvd. public workshop. Friendly Reminder : It's officially summer, which means rain is a given in Florida. 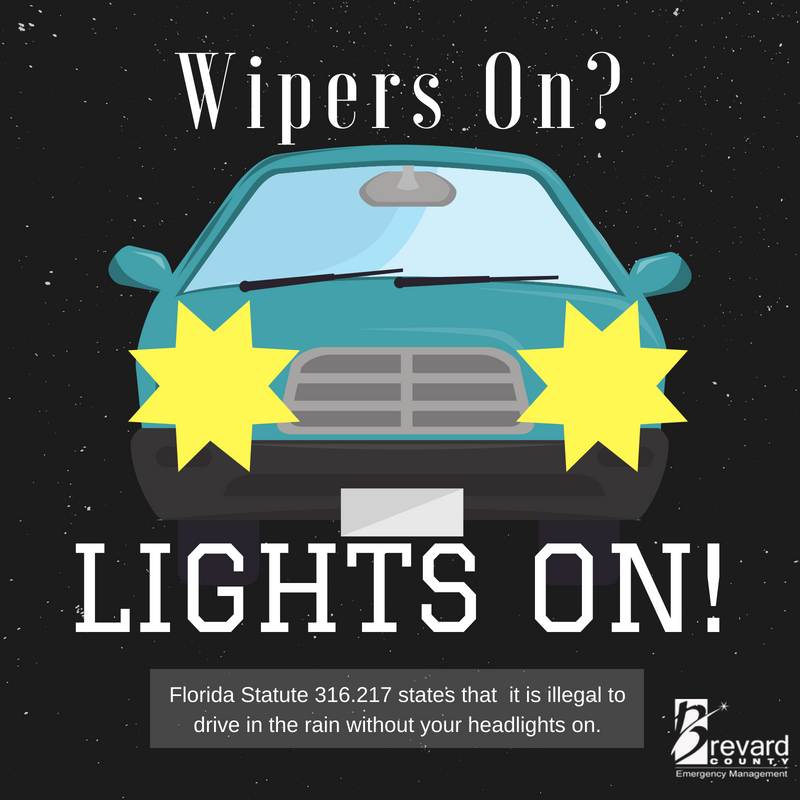 Always turn on your headlights when driving in rain.